Preheat oven to 475-degrees. Mix butter, olive oil, lemon juice, and garlic salt in a jar with lid. Shake well to blend. Coat a foiled-covered cookie sheet with olive oil. Lay the salmon filets on the foil. Pierce each fillet with a fork in several places. Pour the olive oil/butter mixture evenly over the filets. Place baking sheet in oven and roast the filets uncovered about 10 to 12 minutes, or until the salmon is pink and flakes easily. Remove from oven and lift salmon away from the thick bottom skin with a flat turner and discard; place salmon back on baking pan. Spoon pan juices over the filets. In four large salad bowls, divide the spinach. Divide the walnuts, sun dried tomatoes, fresh tomatoes, Provel cheese, and mushrooms among the spinach bowls. Make the Balsamic Vinaigrette dressing by placing the olive oil, vinegars, salt and pepper in a jar with lid. Shake the dressing to blend. Pour the dressing over each of the salads. 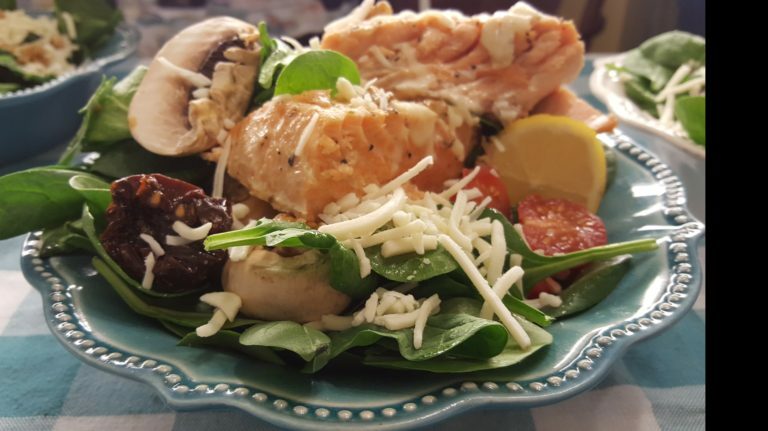 Lay a salmon filet over the center of each salad and garnish with lemon slices. Makes 4 large salads.